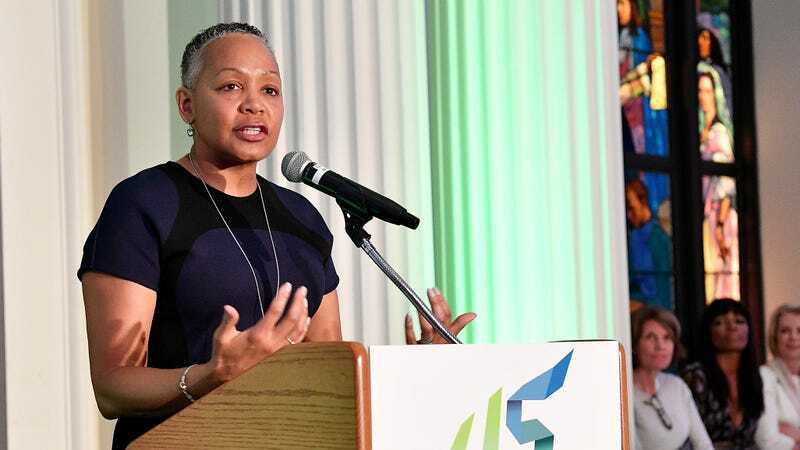 Time’s Up, the organization started by women in Hollywood to combat workplace sexual harassment and assault through awareness campaigns and a legal defense fund, has named WNBA president Lisa Borders as its first president and CEO. She was selected by a search committee that included Grey’s Anatomy et al showrunner Shonda Rhimes, Rich Talent Group founder Jana Rich, Underground star Jurnee Smollett-Bell, and Scandal’s Kerry Washington, Vanity Fair reports. “I’m honored to have this opportunity to combine my experience working across all three sectors, as real, systemic change will require collaboration from each of these arenas. To disrupt and reinvent the ingrained status quo, we will need all hands on deck to create and sustain enduring change. I’m thrilled to lead Time’s Up, and I am convinced that, together, we will shift the paradigm of workplace culture,” Borders told Deadline. As WNBA president, Borders has boosted viewership and attendance, Deadline reports. Before that, she served in executive roles at Coca-Cola and held positions in Atlanta city government.